We recently asked our beautiful stylists what the top 5 haircuts for men that are being requested at each one of our Michigan locations. Hair styles change from year to year and season to season. Some guys don’t realize changing your hairstyle is not just for women! There are traditional hairstyles for men, edgy hair styles, professional hairstyles for men, buzz cuts, fades and more hair cut styles that we get asked by our clients to cut everyday. The Pompadour hairstyle is when the front hair is swept upward and high from the forehead, this is usually done all around the sides as well. This hairstyle is liked by many men and has been a popular hairstyle for young men the past few years. The Undercut hairstyle also known as Curtained Hair features long fringe with a part to the side or middle, with shaved (or very short) side and back of hair. The variations in cuts cover men from teenage to middle age. Guys love this style because it is an easy maintenance style. The Caesar hair style is a form of buzz cut and one of the most popular short hair styles. Our clients love this hair style because of the easy maintenance, buzzed hair all around up to the crown of the head where it is blended leaving the length of hair desired giving the ability to spike or leave it be. Buzz cuts are very popular, a classic buzz cut is where the entire head is buzzed to one length. We offer a great price for a one length buzz cut all around. Many men try to buzz their own hair at home, They think ‘how hard can one length all around the head to do?’. Well, we see a lot of clients with patches and uneven hair from trying to do it themselves. Come in and relax, we will buzz the worry away of having uneven hair and bald spots. We’ll have you walking out with a fresh buzz all around. Out of these Top 5 hair Styles for Men the most popular hair style asked by our clients at all locations is; The Bald Fade. 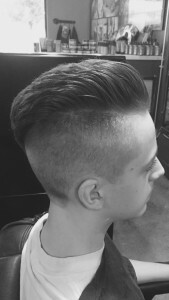 We get many requests for Bald Fades, this is not your normal guys haircut. This is practiced, mastered and creative artwork! Be sure to ask the stylists for the Bald Fade specialist at the Hair Mechanix Shop near you!